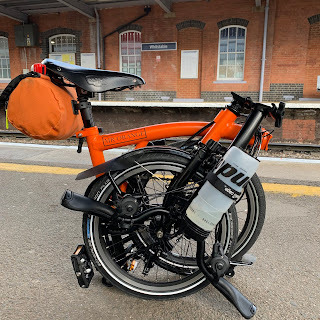 The past twelve months have been very good in terms of Brompton adventures. It actually struck me that a large part of this has been down to David (Navigator extraordinaire). David had guided us safely and expertly on countless cycle rides and for me at least one of the most enjoyable parts on such rides is seeing him at the front with me trying to stay on his back wheel. Regular readers will know that I like taking photographs and although I am never going to be in the league of my cycling Partner BumbleBee, I do my best. David has become over the years a little bit of a muse for my photographic experimentation. So along with leading a ride, making sure everyone knows what is going on etc.., he has to contend with me pointing a camera at him, often requesting a certain look or pose. So, thank you David for leading some great rides and let's hope that 2015 brings even greater adventures.